80's Boulevard is an extra level outside the story mode of Sonic Riders: Zero Gravity. This level and its counterpart, 90's Boulevard, only become available after the main plot is completed. The area is, essentially, a 1980's city, with advertisements for SEGA products from that era like the Game Gear, Fantasy Zone, and Phantasy Star II, as well as the occasional prochronism like Sonic Riders. Race amid cars and rails in the lawless city born of the black hole's wake. Despite being a post-story-mode pan-franchise SEGA celebration, the stage is actually given a kind of plot-based rationalisation, in that the black hole conjured by Master Core: ABIS in Astral Babylon wrenches the city from the past into the present. 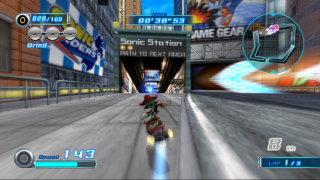 Extreme Gear riders must power down busy city streets, dodging trucks and cars (usually emblazoned with SEGA advertisements). The course also takes racers into the subway, and there's even a section riding on top of an underground train!